Installation. Dimensions variable video, surveillance cameras, closet, c-prints. With a class reunion as a point of departure the project focuses on identity and social status in life. In the installation technologically assisted pranks from high school are recounted, the so-called ‘set-up’s’, where unpopular kids were lured under various pretexts to bad mouth other kids while their conversation was taped and subsequently used for blackmailing and humiliating the victim. Here, a 1:1 model of a closet is connected to a four camera closed circuit surveillance system and equipped with fluorescent doors with little peepholes. Under a rack of coat-hangers is a stool facing a monitor connected to the cameras. As the visitor enter and sink into the darkness of the closet, the cameras give us a guided tour of the exhibition, and at the same time exposing the precarious situation the viewer is in as other visitors are seen circling the closet. Left to their own devices, veiled in the privacy of the closet, viewers are transformed into anonymous voyeurs. 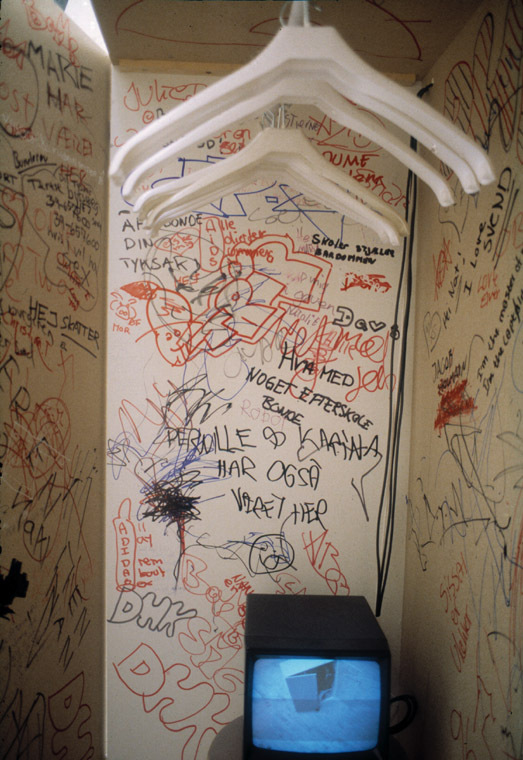 They enact their own private phantasms and obsessions, leaving behind a wall of scribbled graffiti as their personal trace.At the wall photos from the class reunion, a photo of the school and an old snapshot of a garden party are mounted together with an enlarged life size class photo with the eyes crossed over, like criminals striving to hide their identity.